This is all my yarns, fibers, fleeces, books, magazines, dyes, and equipment. The loom is in pieces off to the left of the photo. Now I've got to find homes for it all! I would be overwhelmed too - but you have the rest of your lives to make your dream into reality. It's not the boxes - it's the sheets that don't look studio-like. Yay!!! The stuff is moved in!!!! Phew! Good luck!! Hope you get some time to relax!! Thank you Sue! I know what you mean about some boxes. We moved boxes that were packed three moves ago. No telling what's in them! Wow, congrats on being done with the move part! You'll have fun setting up the studio, rearranging and steam lining once everything is a bit more settled. We have boxes like that...I'm tempted to just chuck them. If we haven't needed it in umpteen years, we probably can do without it. Wow I'm having flash backs! I hope your unpacking is as fun as mine was Ha Ha! It will be fun to see how it turns out. Oh, you poor dear! The heap of boxes takes me back to our recent move! But it slowly but surely comes together, one box at a time. I spotted the sheep peering out from the top, at the back. It must be a relief to have finally moved in. The boxes are just a symbol of all weaving possibilities to come! I know your studio will just look and work wonderfully givin time. I learned my lesson; everybody should move once, maybe 5 years into the game! Then we'd not get such giant piles. I'd say you've done well, and it will all find a place. Actually, after a fire devastated my place a few years ago I moved my fiber into an outside building made just for fiber storage, and with large but cover-able lighting, and no power, so no danger of fire. Has worked better to keep sheer volume under control than anything else, even though that wasn't what I had in mind when I built it--at that point was thinking of fire prevention. Well, you're move now, the only way is up, as they say, so enjoy sorting out all you stuff and putting it where you want! Alison, contemplating a possible move! You've made a good start! Are you living in your new home? I could comment on all the work ahead of you but won't. Any of us that have moved know exactly how you feel. It'll get done when it get's done and try not to let it over whelm you. Love the cutins and cute little sheep peaking out over the boxes. I was wondering if anyone would spot my sheep! Good eyes! Barb, yes we're here. I'm not sure if it feels like "home" yet, but we're here. I don't claim to be the best housekeeper in the world, and I do like to harbor piles of stuff, but the disorganization is tiresome. I'd love to get to my studio first, but too many other rooms demand my attention! At any rate, this room is one I'm looking forward to organizing. How are the kitties liking the new house? Nice to see you have a sheep watching over all that fleece and yarn goodness. Is it an oxymoron to have a Guardian Sheep? 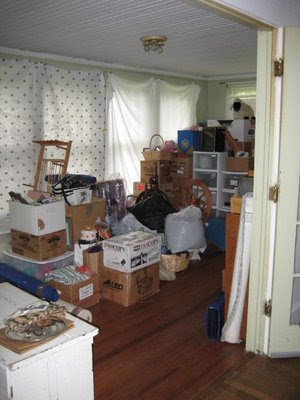 I have to say as a retired military spouse, moving is a nightmare. I have done it all my life and I don't care how many times you move, no matter where you go and how good you are, it's still hard work! But. I got such satisfaction unpacking and putting things away. I did get great satisfaction putting things away in a neat and orderly manner. It's another story as to how long they stayed that way...lol! I know your tired and probably sore from it all, but I love the studio space and will be following you closely as you set up. I can't wait to see it finished, it'll be BEAUTIFUL!! "guardian sheep" - love that comment!! So you are now home. Congrats!!! I, too, love the concept of a collection rather then a stash. Following that, if I buy more Shetland fleece - it's acceptable. So it is a sheep! It suddenly recalls for me the image of a sheep running a yarn shop, sitting knitting with a pair of glasses perched on it's nose, how extraordinary, I think I might be an Alice in Wonderland character. There's a lot of stuff when it's piled up like that, but I'm sure you'll have a super studio as things find their places. With gorgeous windows like that I'd be tempted to put in bench seating in front of them with a lid lifting up to reveal storage space. My boyfriend just discovered there was an Ash tree used by early settlers in north America for blue dyes, common name Blue Ash, Latin Faxinus quadrangulata. Would that do as a shade tree for your studio? I hope things are going well for your household (inc. cats) and that the kitchen is working o.k.! On the bright side, what fun you're going to have getting your studio organised just as you like it! It looks like a lovely space - do enjoy.